We want to share with you the latest news "Kullu" and plans for the future. This year, hunting for snow sheep has developed very well. All hunters managed to take the trophy, and Darryl Hosker from Canada even took all three subspecies (Okhotsk, Kolyma and Yakutia) for a record 17 days. The previous record belonged to Renee Snyder from the United States - in 2011, she first stories "Kulu Safaris" took all three subspecies - and in just 22 days. This year,Renee Snyder the prestigiousawardin the huntingworldWeatherby,and wewarmly congratulateherwell-deserved victory! Going back to the autumn hunting in 2014 - this year mainly hunters took Kolyma and Okhotsk subspecies of snow sheep, and two of the three groups of hunters to hunt snow sheep finished in 3-5 days (from 15 to 18 August and from 1 to 5 September) - which is another record this summer. And if you have to talk about records, not to mention a wonderful trophy Okhotsk subspecies, produced by Richard Sand from Denmark! The other day he told us the exact dimensions of your trophy, horn length 42-1 / 8 41-6 / 8 inches and the total score was 175-1 / 8 points SCI. This is the biggest trophy snow sheep taken from our hunters in the history of "Kulu Safaris!" - And we are in this business since 1992. Previous record belonged to our world Stanley Golub, which in 2008 with "Kulu Safaris" took Okhotsk subspecies 173-3 / 8 points SCI. 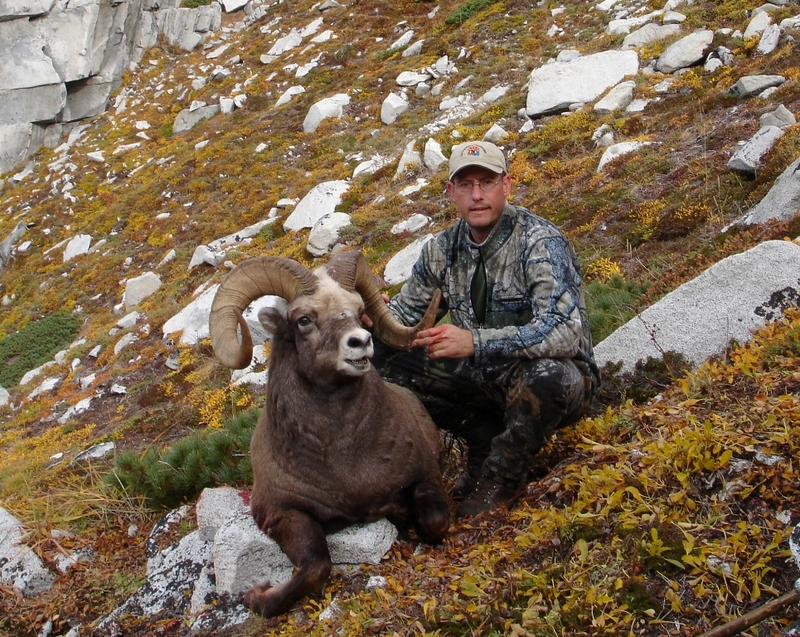 This ram was the world record for all subspecies of snow sheep in 2008. We hope that the trophy Richard Sand will also be honored with awards! (Reviewed by Richard Sand hunting). Please visit our photo album to see 2012 snowsheep trophies. Now we are preparing to brown bear hunts. We'll be glad to hunt with you some day! Welcome! We would like to share with you the latest news from "Kulu" and tell you about our plans for the future. The bear hunt has ended recently. This year there were 3 groups of hunters which included both Russians and Americans, as well as guests from Bulgaria and far Costa Rica. We are glad to announce great results of the hunting: nobody left without a trophy, some hunters took even two bears. The overall result is as follows: 23 hunters took 40 bears, ranging in size from 240 cm to 295 cm from nose to tail. All three tours of the hunting were held on snowmobiles, even including the hunt on the coast of the Okhotsk Sea. Low temperature kept excellent snow cover, which allowed to move freely and hunt successfully using snowmobiles even in late May. In the spring of 2011 three basic camps were involved: Naslachan, Shirokaya, and Pyagino. Camp on the Shirokaya River was built last summer and now it is as comfortable as the rest of our camps: you will be pleased with a real Russian bath and a spacious dining room. There are also thermal baths in three kilometers from the camp. At present moment we are preparing for autumn hunting. We are planning to conduct our tours on all three subspecies of snow sheep that live in the Magadan region, – Okhotsk, Yakutsk and Kolyma snow sheep. Hunting will begin on the 1st of August and continue till October. 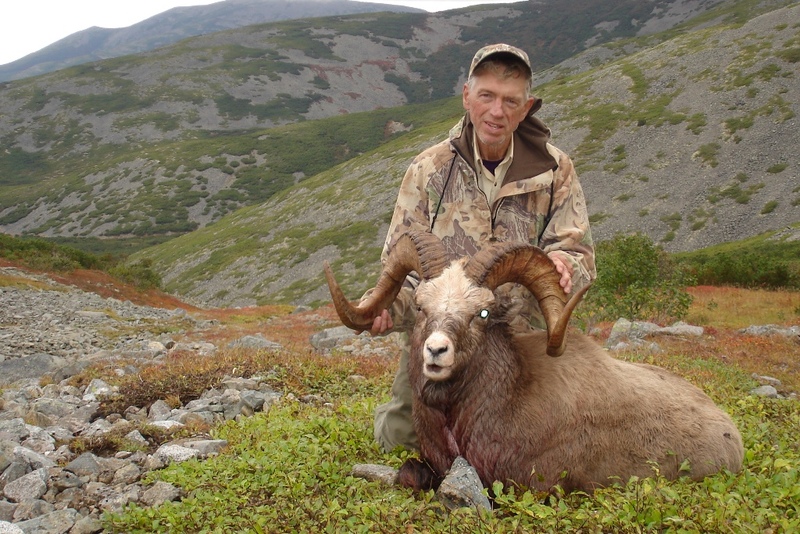 We are very happy to congratulate Eugene Bell, who went to hunt for Kolyma snow sheep in September 2006, with SCI #8 World Record Kolyma Snow sheep!Lately he's been informed that a photo of him with his trophy would be published in Mountain Game of the World Record Book! Dear Hunters! We are glad to share with you our good news! Just few days ago "Safari" magazine (Russia) has announced winners in the "Man of the year" contest. Sergey Rudakov became a man of the year in nomination "For hunt and game husbandry weal". We promise to continue our work for further development of hunt in Russia and in Magadan region in particular! We were glad to meet some of you during Safari Club International convention in Reno this January and at OVIS/GrandSLAM convention in Las Vegas! We have good news: Kolyma snow sheep taken by Jerry Brenner (USA) in September 2007 with KULU Safaris is acknowledged as SCI world record category “Snow sheep”. It’s score 165 7/8 SCI !!! WE are very glad for Jerry and Geoffrey! Congratulations!! 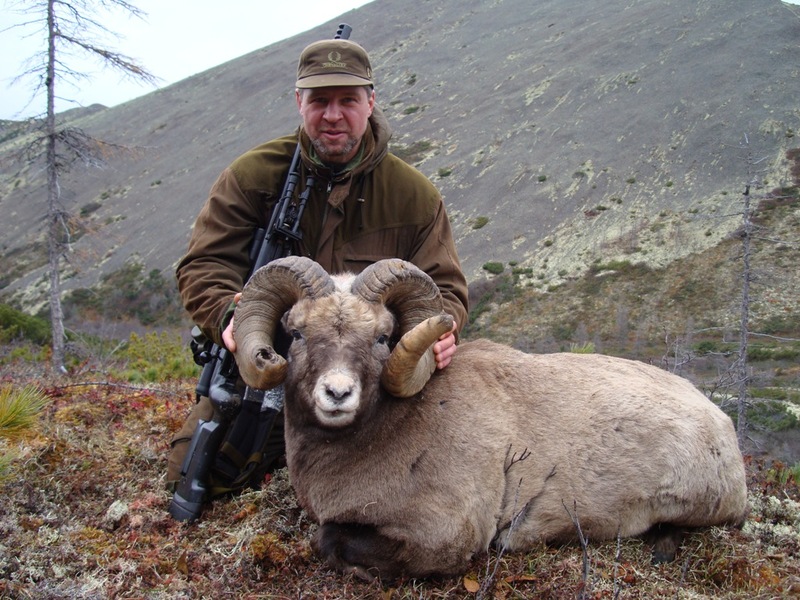 But in October 2009 Stanley Golub (USA) during his hunt with KULU Safaris took Okhotsk snow sheep that will exceed even these achievements! It’s score 173 5/8 SCI and it has been already nominated for Carlo Caldezi Award and for sure will be new world record. We expect rain of awards for that outstanding trophy!! 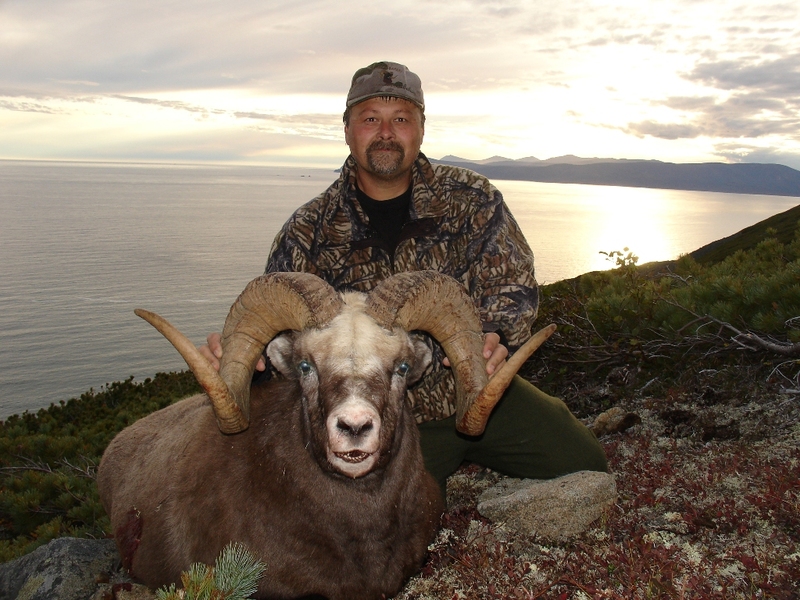 In the same camp another good Okhotsk snow sheep trophy has been taken by Donnie Vincent (USA) in October 2008 and we hope Donnie measure it and enter in record book– we are sure it will be among best snow sheep trophies of last year too. Sergey Samotin (Russia) took a very unusual and beautiful Okhotsk snow sheep trophy too in September 2008. The old warrior is at least 17 years old! Our Kolyma snow sheep trophies in 2008 were also very good. You can see pictures. We will be glad to meet you in our hunting camps! Wares for outdoor activity and tourism!